Now that esteemed websites like NewsForge are assessing the true cost of One Laptop Per Child and the debate has expanded on the related website Slashdot , I'd like to expand on my comments in the article and others' comments on Slashdot. First off, like the rest of OLPC News, I actually embrace the OLPC's goal, love the technology, and hope it succeeds. But as an avid F/OSS evangelist and Ubuntu user my main concern is that this is untested technology and methodology with unrealistic implementation cost estimates. If all goes well, One Laptop Per Child will revolutionize education worldwide. If it doesn't go well, poor nations may go irrecoverably into debt and will turn away from information technology projects, especially F/OSS projects, for decades to come. This leads to my main point, and the argument I will continue to make - OLPC should enable and encourage manageable pilot projects within each country, and let countries make informed decisions on further implementation. Unfortunately, to date Nicholas Negroponte has said OLPC Children's Machine XO pilots are ridiculous. Next, some Shashdot posters have argued that there have already been pilot projects. First, the Cambodia villages represent one pilot project, with donated (not debt-financed) laptops (not even OLPC laptops! ), and a great deal of personal attention from Negroponte and friends. Further, no real data has been released from this project. It is good evidence that an OLPC project could get traction in rural Cambodia with much personal support- but that doesn't tell us much about what will happen in Brazilian favelas with the OLPC implementation plan. Then, another Slashdot poster compared the OLPC to Yunus' Grameen cell phone project in India, and argued that they're the same. I actually think that the OLPC laptop could make cell phones look like a speed bump on the road to development. The OLPC laptop is incredibly well thought out, and has an unbeatable hardware price (well, almost). But hold on. 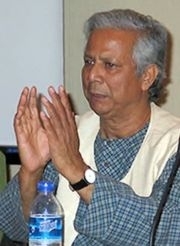 Read up on Yunus' organization. It has a fantastic model for development, reflected by his Nobel Prize. They give micro-loans to interested people in a community that has little or no technology, train them in the cell phone, and let them go to town. The person has to come and ask for this process. Sometimes it doesn't work, sometimes others in the community begin taking out loans for cell phones too, setting up competition. This is very, very different from the government paying for a few million laptops, distributing them to schools in a huge push, and hoping that the social returns on their fiscal investment will make it worth the extra debt burden they just took on. Remember, some of these countries are already up to their eyeballs in debt repayment, with up to 80 cents on every tax dollar going towards debt fees. Selling a few million laptops to a country's education ministry will be an outright failure, ending up with the government even deeper in debt. Rolling them out a bit more slowly, allowing for organic processes of diffusion to work, and best practices in-country to emerge, is a much better deal. So would re-reading the original $970 price post and all its comments before disbelieving the numbers. They're from OLPC themselves, UN averages and a case study from a similar USAID project. Yes, they're big numbers, but nothing compared to the $150 Billion dollar dreams of OLPC. > So would re-reading the original $970 price post and all its comments before disbelieving the numbers. They're from OLPC themselves, UN averages and a case study from a similar USAID project. > As for Internet costs - hopefully, this will all be moot, as will the entire line item, with the satellite access. Given than, I'm not really surprised that India has much lower cost Internet access than the average non-OECD access costs. So, which is it? Are you going to believe that OLPC has a deal for satellite access (and could likely replace it if it disappeared) and remove the $540 for internet access that you constructed, or defend your "but something could go wrong with the net access and then the total would be more than twice as much!" dishonesty? Note the word "hopefully." The Internet is a big question mark. I have problems believing that satellite bandwidth providers can avoid going bankrupt selling capacity for $1/child to a few billion children worldwide, in growth steps of millions at a time, in perpetuity. And this is being nice and presuming that the $108 setup costs revealed in the Libyan MOU go towards buying and installing satellite dishes, and not worrying about repair costs for the dishes themselves. To the hopefully-global audience reading this; what are the local ISP costs and services in Brazil, Argentina, Libya, Nigeria and Thailand? The more accurate numbers we can find for implementation, the better! In Brazil, maybe we can find some training/educational integration costs, as well as loss/theft/breakage rates for the PeoplePC? Anyway don't you be pooh-poohing cell phones so fast. If it needs people to step forward, all the better. That way you make sure the people actually want the technology, rather than shoving it down their throat, as OLPC is bound to do. Besides, in a country as big as India, even a million laptops is a small fraction of the children, so who gets to decide which kids get it and which don't? Cell phones in India (even the free market non-subsidized kind) have made an enormous difference to poor people's lives in the last 5-10 years (I've seen it first hand). I like the quote "When you get a mobile phone it is almost like having a card to get out of poverty in a couple of years." That's so totally true. Oh, don't get me wrong - the Grameen Phone project is the shining model for how to do ICT development. The technology is well-tested thanks to global markets, the deployment is easy to do through towers, the device is easy to use (you can use it just like a normal phone), and the diffusion model through market mechanisms with very friendly loan terms and lots of support in early stages is pristine. > I like the quote "When you get a mobile phone it is almost like having a card to get out of poverty in a couple of years." That's so totally true. Can you elaborate on the number of people lifted out of poverty due to cell phones? jon: you mean $150,000,000, right? or $208,000,000? or $970,000,000? Won't internet service be cheap because it will get to the users via a mesh network instead of phone or cable lines? "Can you elaborate on the number of people lifted out of poverty due to cell phones?" At the beginning of 2000, India had 1.6 million cellphone subscribers; today there are 125 million — three times the number of land lines in the country. With 6 million new cell phone subscribers each month, industry analysts predict that in four years nearly half of India's 1.1 billion people will be connected by cell phone. That explosive growth has meant greater access to markets, more information about prices and new customers for tens of millions of Indian farmers and fishermen. One element of poverty is the lack of information," Prahalad said. "The cellphone gives poor people as much information as the middleman. He said cellphone growth is driven by the young -- more than half the population is under 25 -- and, increasingly, by people in neglected rural areas. In a country where the World Bank calculates that nearly 80 percent of the population lives on less than $2 a day, Ramachandran said cellphones have become the "poor man's phone." This explains why I get so many Indian people ringing me trying to sell me 'Time Share' accomodation packages, Investment Advice, Cell Phones and answering help desk calls. I don't think internet access will be all that terribly expensive. An entire village or town can share one VSAT connection to the internet by using off-the-shelf linksys wi-fi routers as repeaters. I think internet would be much cheaper for olpc because it would be distributed through the mesh net, instead of over land lines as is done with commercial services. Eduardo - You're very correct; the mesh network solves the "local loop" problem of connectivity, which has always been the most expensive link in getting telecom to a community - there's a great series of articles by D. Linda Garcia on rural telephony in the U.S., where cooperatives set up their own local loop. Anyhow; I already calculated in sharing, estimating that 10 children would be able to share a 56k modem. Slashdot readers tore apart those implementation figures. So why would you add Slashdot as a link supporting your story? This spreadsheet (in portuguese, costs in "Real" currency) shows that digital inclusion of ALL childrens in Brazil will costs just a 50 grams bread a day per children. Ancillary, shows that OLPC project will costs TEN TIMES LESS than desktops laboratories, in using hours. Satellite Internet is the next-to-last resort, just before sneakernet (carrying CD-Rs or flash drives or laptops from village to village). The real solution for nationwide connectivity is WiMax, which has a 30 mile (50 km) service radius around each access point. Sprint plans a system in cities across the US at an announced cost of $10 per person covered for the first hundred million. A national WiMax network is in development in Pakistan, and other countries will soon follow.